We’ve really been into eating pizza at least once a week lately. 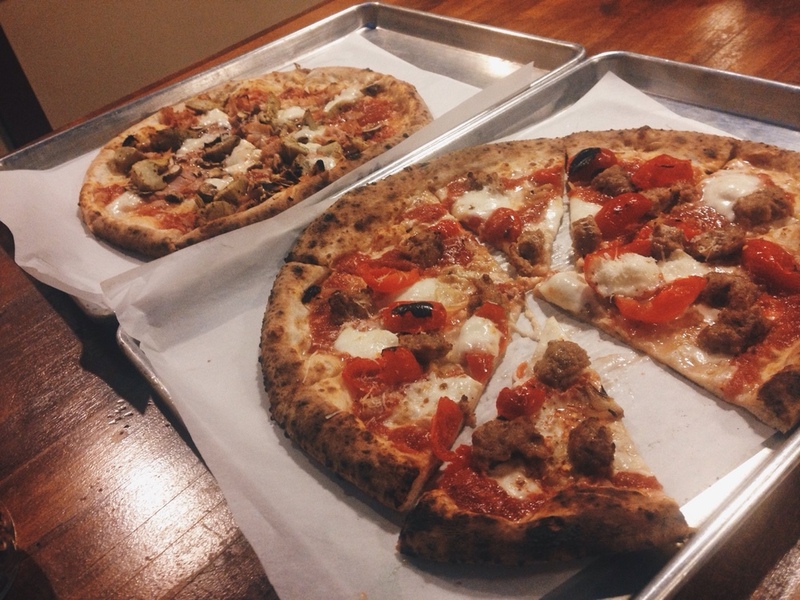 Desano’s downtown has quickly become one of our favorites! It’s a little pricey, but you can’t beat the quality, speed, and customer service. Their manager goes around to every single table to be sure they’re having the best experience possible. He’s so genuine about it too, unlike other restaurants. He’s great at asking about more than just how the pizza tastes. Last night we had the capricciossa with artichoke hearts, mushrooms, prosciutto, garlic, and mozzarella as well as the san genaro with sausage, peppadews, cartelized onion, buffalo mozzarella, and garlic. They paired together really well! Perfect mix of savory and sweet. I love the big tables that invite people to mingle and the fact that there aren’t any plates. Just grab it and eat it! It’s pizza! I would highly recommend going out for pizza and grabbing a few cannolis for dessert to go.